If you’re new to reading me I try and do these one-bottle-posts because I firmly believe that the time it takes to review a wine in no way compares to the time a winemaker takes in making said wine. That seemingly obvious statement is my way of paying due respects to any and all winemakers. I drink the stuff, I don’t want to make it, and I thank Bacchus that they put their hearts into the work. 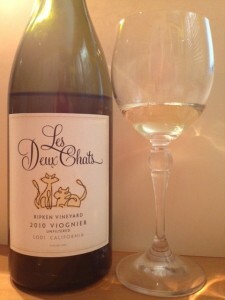 Now, onto paying my respects to Chris and Patty Connolly, the winemakers behind the cute Les Deux Chats label. This is just for observation sake, held over a white sheet of paper (the photo has a manila folder in the background) the unfiltered wine was not cloudy, but clear with some diamond sparkles, the color was the palest shade of lemon. Pear, pink grapefruit, juicy peach, sweet Hawaiian pineapple and a little bit of elderflower thrown in. Ripe pear, apple pie, lemon, apricot, sweet cream, tanginess/acidity softens immediately – prior to the lingering finish. It’s 2 bottles at a time, for each release, when they are released. Each release is not to exceed $66. Les Deux Chats Cellars is a small family owned winery. Producing limited production single vineyard hand crafted wines. Les Deux Chats Cellars is a small family owned winery. Producing single vineyard hand crafted wines. Our passion for winemaking along with limited production allows us to focus on the details and produce high quality wines. To keep up to date of what we have going on, please “like” us and see our wall and photos. Ahhh Viognier. This is my favorite date wine. I have often noticed that my friends often prefer wines a bit too scented for my palate. For me, Viognier is that happy balance. Typically there is good fruit and a more than worthwhile finnish.